The call came from a DHS supervisor at midnight: “We have a three-year old girl at the hospital. Her mom was shot and is not expected to live through the night. Her dad has been arrested. Domestic violence. All clothing was taken by police as evidence so if you could bring a blanket that would be great. Can you come pick her up?” Yes. The call came from a CPS worker while I was making dinner: “I just came on the scene to find a four-year old boy sitting in the back of a police car. His clothing is soaked with urine from his mentally unstable mother; he may have lice, and he is filthy. Can we bring him to your house?” Yes. The call came from another county as we were getting ready for bed. “We have a two-year old who is sound asleep at the DHS office now. She was brought to the ER with an injury. Her mom was so high on drugs she could hardly function. This little girl is adorable. We just need someone who can take her for the night. Could you?” Yes. The call came from the placement desk while I was in the middle of a run. “We have a tiny, ten-day old baby boy. Things aren’t working out with his current foster home, and we need to move him. Do you have an infant car seat?” Yes. My husband and I are biological parents to two young kids, as well as foster parents to a revolving crew of kids under the age of five. A friend, who also fosters, once told me that calls from DHS are like a Create-Your-Own-Adventure Game. Each “yes” takes your family on a wild new adventure you never expected. I always wonder what adventure we are missing out on with the calls we can’t take. We say yes because these broken babies need a safe place to land. They need a mommy to wrap them in blankets and tuck them in at night. They need a daddy to hoist them up on his shoulders and gallop them around the backyard. They need clothing that fits and food that nourishes. They need to be tickled and trained and taken to the zoo. They need boundaries. They need love. I have been surprised to find how much we need these little people, too. They are sweet and feisty and stubborn and funny. They keep us on our toes and teach us lessons we need to learn. People tell me all the time, “I don’t know how you do it! I could never become a foster parent. It would be too hard to say good-bye to the kids once I’ve gotten attached.” And I get it, I do. I used to say the exact same thing. But now, I wonder what in the world I was thinking. Was I serious? It would be too hard for… me? Make no mistake. It is hard. There are plenty of days when I feel like I just don’t have it in me to do this. My ideas and energy and patience fall flat. Some kids have night terrors, others have accidents. You wash a lot of sheets. You fold a lot of socks. You buy a lot of diapers. There are endless meetings and appointments and phone calls. There are false accusations and frustrating decisions. Foster parenting can be tough. Emily is a foster mom in Portland, Oregon, who has been married to the love of her life for almost 12 years. They have two adorable kids, who keep them laughing and Googling. Emily also volunteers with Embrace Oregon. Wow! What a great example you set! I hope others will have the courage to take this leap of faith themselves. We “unofficially” did foster care once. The story was exactly the opposite of what the parents told us. They were a nightmare, the little one was a joy. Thankfully it all turned out well. While it was hair-pulling for us, I can see how God called us to stand in the gap. While we’re not called to do foster care, God has also called us to do hard things. For us it was traveling to Africa at a time when, because of chronic pain, I could barely walk. We’re now making preparations for trip #6 😉 Never say never! That is amazing! Bless you on your ministry to Africa and thank you for taking the time to stop by M2M! This is so great that you foster so many kids. It is great for those kids to have a mother-like figure to take care of them. And thank you for visiting M2M! This brought tears to my eyes. Last year I was working at a barn where I taught riding lessons and was asked to assist with a troubled teen program – something I had never done. The teen I worked with was a girl in the foster care system, age 16. I come from a very stable family and had no experience with foster care, but I worked with her for 12 weeks and watched how the family who fostered her discipled her daily. A year later, I attended her baptism, and this weekend, I am attending her adoption party by the family. 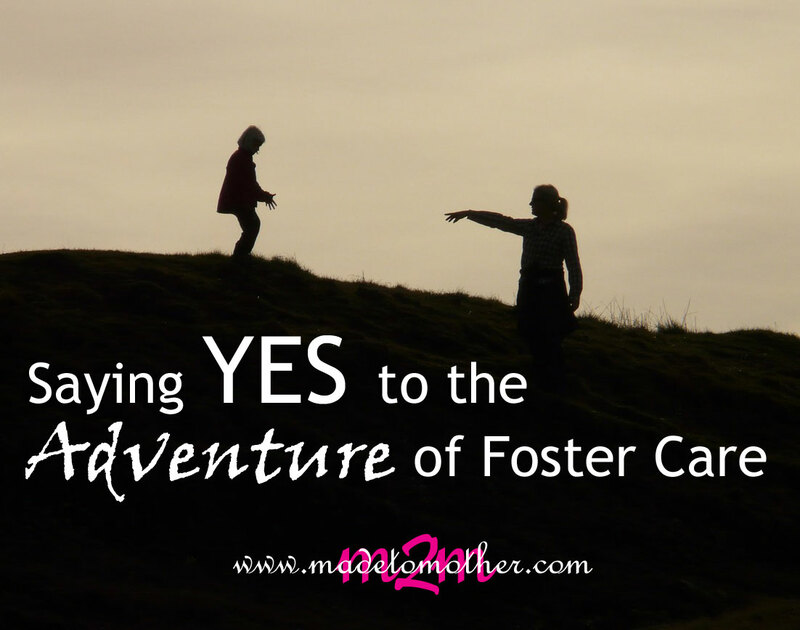 It has changed everything I knew or thought about foster care, and has enabled me to better reach out to the young women I minister to on my own blog. Thanks for this post! Even as a 24 year old not-yet-mother, it was amazing to have a hand in this young woman’s life and see how the right family sacrificing time, money and energy to do foster care brought her to Christ. Amazing! I look forward to checking out your blog as well! I hope you’ll come back to M2M each week for more real stories by real moms! I love your perspective – that we say yes to suffering in order to be WITH those who suffer – this is what Christ did, isn’t it? Visiting from Unforced Rhythms. Amen! Thanks for clicking over here! Hope you come back for more stories! Wow! What a blessing it must be to love these kids, even if its only for a little while. And what a blessing you and you husband must be to these kids. Thank you for visiting M2M and your kind words! I hope you will come back again for real mom stories! You may never realize the impact you are making on the lives of these children. The infants won’t remember being in your home, but the other little ones will! Amen! Thank you for reading Emily’s story here on M2M, I hope you come back again soon for more! 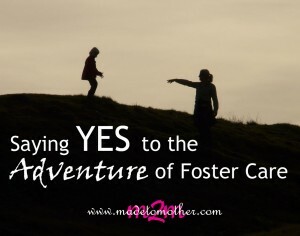 It takes amazing, strong people to be foster parents. Thank you for stopping by M2M, I hope you come back each week for more real mom stories! Amen and thank you for your kind words! Good for you! Thank you for saying to “yes” to God’s leading as well, bless you! You have an amazing testimony! So much encouragement and real-ness for ones who also adopted or feel led to adopt. Blessings! That’s beautiful! And encouraging to give this idea some more thought and prayer. Honestly, I don’t think our family is in a place to seriously consider doing this at this time (due to space restrictions- I know they do consider things like this during the home studies or whatever- just not sure how much) but down the road when God gives us the resources it would be an awesome thing to do. Thanks for sharing your story! I’m also one of those who says it would be too hard to let them go—or too hard on my own kids to say goodbye—etc. etc. etc. Thank you for being a blessing and for opening our eyes. May God continue to bless you and your family and thank you for sharing this with us at the #WWDParty. God has given you so much love so that you can pour into those who need it, who need Him. Was truly blessed by your story. This is a moving story. Thanks for sharing it with the Let’s Get Real party. What a heart wrenching yet inspirational story! What a blessing Emily and her family are to the children that come into her home! It is so sad to think that any child has to endure the hardship of abuse or neglect. Thank God for people like Emily who are willing to open their hearts and homes. Thank you for sharing on Makeovers & Motherhood’s Welcome Party Wednesday Link-Up! Wonderful description of fostering, the heart behind it all. I’m so glad you shared with this Cozy Reading Spot. It was the perfect read for my morning! Thank you for stopping by! I hope you’ll come back each week for more REAL mom stories! This touched me so deeply tonight. As my hubby and I move to a home that could finally allow us to foster children, I am almost in tears as my desire to serve the Lord in this way might one day be fulfilled. May the will of the Lord be done. Thank you for sharing this amazing story. Thank you Emily for being an example of the woman I want to be. For Christ’s glory. PS. Could I share this story on my blog, with the link to this post, of course? AND could I translate it into Spanish, and share it there as well? Thanks for visiting, Johanna. Yes, you may share the story and translate it, but please refer back to this link and only use the image here, not the one Love What Matters shared on FB. Thanks again, and may God bless your family and the children you help! This is so well written! My husband and I have been married for 26 years and have been foster parents for 23 of those years. We have fostered over 40 children, have two birth children and have adopted as well. Until our birth children were born, we took teens. We took them for exactly the reasons listed here. They were having to go through what is hopefully the hardest time of their lives and the deserved to have someone to be there for them…even though they may not seem to want that. It isn’t always full of smiles and warm fuzzy moments but knowing we were there for them and that we did everything we could to make things better is a sometimes all we can do. She is right. It is hard to say good-bye. I really think it’s a God thing. He entrusts us with his children and then when it’s time for them to move on we have to have faith and trust in Him. Which sounds good, but isn’t true. Foster panics like the one going on for the past 1.5 yrs or so are predicated on this myth. Actually, seizure from home (and school, and friends, extended family, pets, etc.) is, in and of itself, a trauma. Don’t label every kid in foster custody (the term in the court paperwork) as “abused.” Many are simply poor – which isn’t solved by handing them off to stranger. Every child deserves good care, rightly r wrongly removed. That is a given. Absolutely true, and I know Emily would attest to this as well. Thanks for visiting and for leaving a comment. Blessings to you! Thanks for your polite and non-defensive answer. It fosters dialog and enhances info sharing.